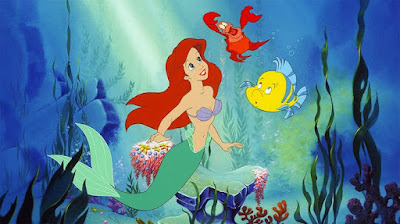 When it comes to Disney movies, The Little Mermaid was my first love. The Little Mermaid changed everything. This may seem like hyperbole, but it isn’t. There are Disney movies that I now love more than The Little Mermaid, but I absolutely revere this wonderful film, and it will always hold a special place in my heart because it was really the first. More on that later. As detailed in Don Hahn’s wonderful and essential documentary Waking Sleeping Beauty, Disney in the 1980s was a company on life support, going through the motions and trying very hard to reclaim former greatness, but never really hitting any home runs. Under the leadership of Walt Disney himself, the company had thrived and been a bastion of creativity, always pushing the boundaries of what could be done. When Walt died, a big portion of his company died too, though it took years before to become completely apparent that the spirit was gone, though the body still lived. The Jungle Book was the last movie that Walt was actively involved with, and if you look at the movies made over the next two decades following his death, you’ll see how much the company was struggling creatively. Walt Disney Animation Studios only created seven feature films between the passing of Walt and what we now call the Disney Renaissance. Seven animated movies in 22 years. Clearly something was wrong. That’s not to say that the movies made after Walt aren’t worth anyone’s time. There’s good stuff in there, and there are several that I like to defend as unappreciated, but they don’t quite have the qualities of the films made during the golden age of Disney. Believe me, I was a kid in the eighties and my friends and I all loved later-era Disney movies like Robin Hood, The Rescuers, The Black Cauldron, and Oliver and Company. We instinctively knew, though, that they weren’t in the same ball park as movies like Cinderella, Sleeping Beauty, and Peter Pan. How could they be? That was in the past, and even as kids we knew that the Disney we loved was not the Disney our parents grew up with. It had declined, as all things do over time. 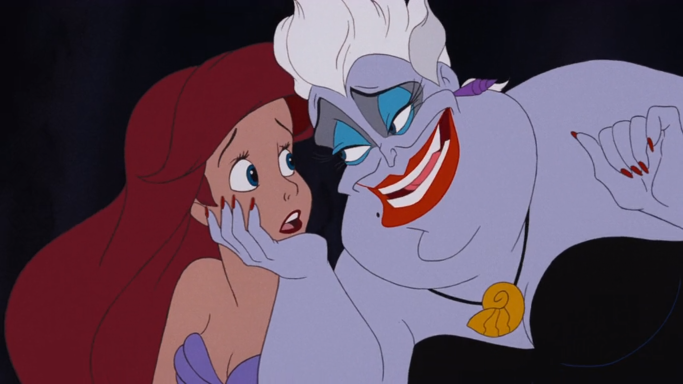 But then the Little Mermaid hit theaters, and it was like an atomic bomb inside my brain. 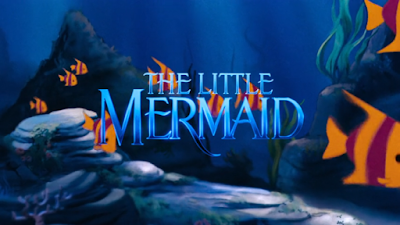 Written and directed by Ron Clements and John Musker, the two talents that had brought The Great Mouse Detective to screens five years earlier, The Little Mermaid heralded the triumphant return of Walt Disney Animation Studios and the kind of movies that Walt Disney himself had passion for creating. The Little Mermaid returns to classic storytelling by once again drawing on a fairy tale for inspiration. Audiences hadn’t seen a fairy tale in their Disney animation in an entire generation of filmmaking. All these years later, I still adore this movie. I love the magical, musical, undersea kingdom populated by a benevolent king and his daughters. I love Sebastian, the stern Caribbean crab with a heart of gold, brought to life by Samuel E. Wright, the same actor who would play Mufasa in the Broadway adaptation of The Lion King. I love Flounder, the vulnerable sidekick who has a heart that belies his diminutive size. I especially love Ursula, the sea witch, voiced by Pat Carroll with more relish than one would believe possible. Most importantly, I love the world as it’s brought to life by the designers and the animators. Faces—especially those of animal characters—are animated with expressions that are incredibly human. The underwater environments that they inhabit can vacillate between inviting and foreboding in mere seconds. But most importantly, I love Ariel. Now, as an adult, I can look back on The Little Mermaid and see that it features a strong female lead with passions, gifts, and desires all her own. Oh, sure, some detractors will point out the love story and say that she’s defined by Prince Eric, but I don’t buy that. When we meet Ariel (voiced perfectly by Jodi Benson), she’s a big fish in a small pond, stuck in a place that she longs to leave behind in pursuit of what lies beyond the horizon. From the beginning, we know that there is something different about Ariel that sets her apart from all her peers, and it’s not just her flame-red hair. She’s called to bigger things, to broader horizons, and by staying in this one small community, her soul is dying. Yes, there’s a love story, but love is beautiful and this is, after all, a fairy tale. I can tell you that it didn’t matter to me that the main character in this story was a girl; I related to her instantly then, and I relate to her even more as an adult. It didn’t matter to my friends, either. We all loved this movie, and we all saw it as something very special. Did all the boys think she was beautiful? You bet. But she was more than that, way more. Before Disney marketed characters like Ariel as princesses, they were just heroes. They went on dangerous journeys, conquered evil, and lived happily ever after because they did what was right and followed their hearts. I responded to Ariel just as much as I did Luke Skywalker…maybe even more. She was an extraordinary character in an ordinary world, longing to break free. For myself and so many others, we saw ourselves in Ariel. Of course, it would be criminal to talk about all the wonderful aspects of this movie and fail to mention the incredible music. 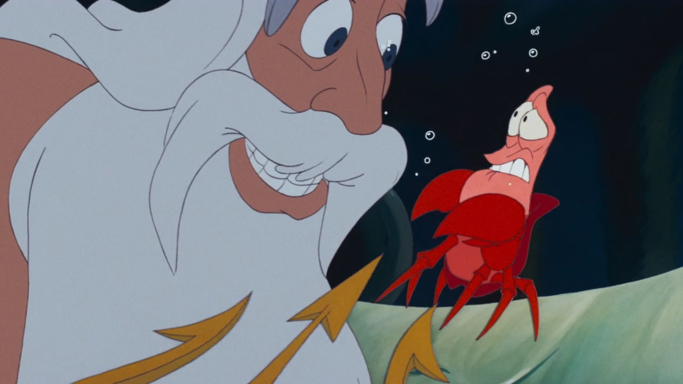 In the years before The Little Mermaid, Disney had often dropped music from their animated films altogether. They’d recently dipped a toe back into the musical component of their films with Oliver and Company, which was their version of the Dickens classic Oliver Twist with positive results. That movie relied heavily on the music of Billy Joel, which was certainly timely and appealing to audiences of the day, but The Little Mermaid goes in a different direction, drawing inspiration from Broadway, not pop music. In doing this, it doesn’t become timely; it becomes timeless. The score and music for this film were brought to life by Howard Ashman and Alan Menken, who had just come off the blockbuster success of the Broadway musical Little Shop of Horrors. It was Ashman and Menken who treated this new Disney animated movie like a Broadway musical, refining the larger “show” elements of choreography and musical storytelling, elevating it far beyond simple kid fare and into the lofty realm of actual theatre. They built the storytelling into the songs, allowing those sweeping, orchestral movements access to places in our soul that story alone simply cannot touch. 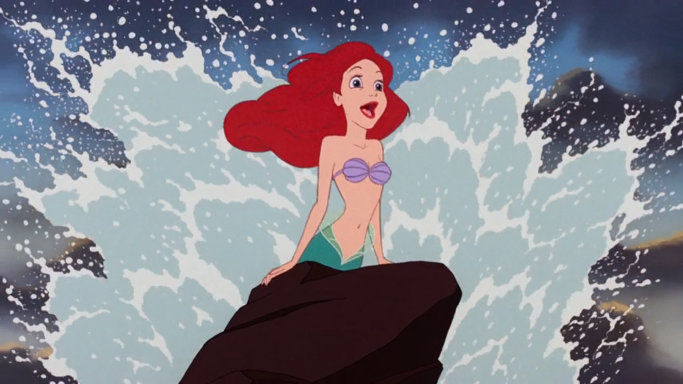 When Ariel reprises her “I want” song, “Part of Your World,” later in the film, the scene culminates with her staring at the life she so desperately desires as the waves splash upon the rock around her, creating one of the most iconic images in all of Disney animation. By using both powerful visuals and beautiful music, this is storytelling at its strongest. The year of 1989 (and even into 1990) was defined by Batman and The Little Mermaid, at least for me. Both movies were everywhere in ways you can’t even imagine if you weren’t there. We still have major pop culture events today, but we tend to move on within a matter of days, if not hours. We did not move on quickly from those two movies in 1989. We lived with this stuff, pored over it, went to see it again and again. All my friends had the soundtrack on cassette (no one I knew had a CD player in 1989) and we all wore the tape out. And remember, I wasn’t four or five years old; I was going into middle school when appearances are everything. We just didn’t care! We loved it, and we all knew that there was something special about this Disney movie. It felt different. It felt electric. I even had the original movie poster on the back of my bedroom door, complete with the phalluses that the disgruntled Disney artists had hidden in plain sight. In some ways, I wish that I had something bad to say about this movie just to balance out all this reverence, but I don’t. Whenever I watch it, I’m immediately thrust into this world once again. From the first notes in the chorus of “Fathoms Below” all the way to the end credits, this is a movie that still has tremendous power over me. This is not because of nostalgia, though I could never deny that plays a part. No, The Little Mermaid really is THAT GOOD. It singlehandedly revived the spirit of what Walt Disney wanted for his films and had been missing for over twenty years. It kick-started the Disney Renaissance, leading the way to Academy Awards and critical recognition for the first time in decades. This was the first Walt Disney Animation Studios feature film to win an Oscar in 43 years. And because of this film and its success, nearly every Disney animated film since has been either won an Oscar or been nominated. Nearly three decades later, Disney is still following the pattern set by The Little Mermaid with only occasional periods of stagnation. 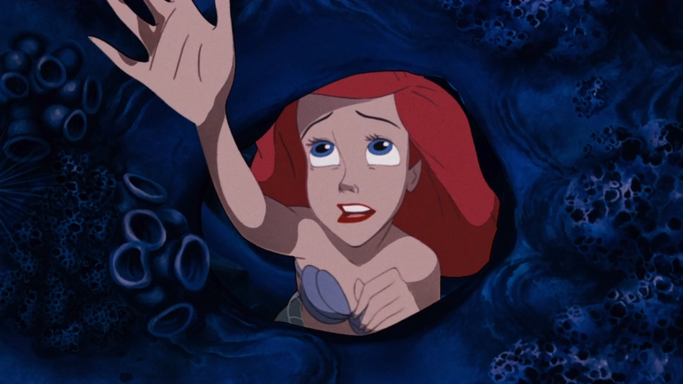 Yes, we’ve come a long way with movies like Frozen and Zootopia, but the current success of Disney’s animation division all these years later still owes a huge debt of gratitude to a wonderful, restless girl named Ariel and the risks taken by the talented people who helped tell her story. Loved this article and your love for this movie! It's actually cool to read about a boy's response to the character. I feel like I dream in Little Mermaid animation. I just can't get over a lot of the dreamy-femininey-gothy visuals in it, like Ariel looking into the crown heart and selling her voice, and my favorite- when Ursula parts the seas. Florence and the Machine is Like the perfect soundtrack to these dreams. And that prince statue! The underwater world is so full of so many dreamy things. Like you could draw anything in there and explain it by saying "well it just fell from a ship". Ariel is, if I remember right, mostly desperate. I don't think they show her pouting and grumbling about her dad as much as the other Disney girls. It's like more high drama and emotional. Thanks for the insight about the broadway background of the guys who did the music. Makes sense!